Western states made a dramatic intervention in the Syrian war earlier this week to extricate hundreds of terrorist militants. The militants are to be fast-tracked for resettlement in Europe and Canada. But in saving their terror assets, Western governments are risking future public safety as well as sowing seeds for increasing multicultural strife. 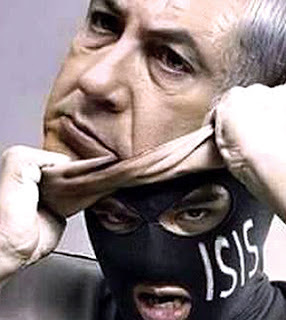 In a stunning revelation of the foreign links to the extremists in Syria, Israeli Prime Minister Benjamin Netanyahu ordered his military forces to evacuate up to 800 militants belonging to the so-called White Helmets. 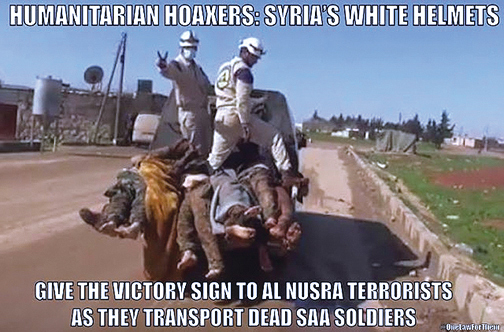 They are the propaganda merchants for Nusra Front and other al-Qaeda-linked terror organisations. Separately, there were reports of four senior jihadist commanders being given safe passage by Israeli forces out of Syria as the Syrian army closed in on the last-remaining militant strongholds around the southwest city of Daraa and Quneitra province. Nor was it coincidental that the evacuation operations were accompanied by Israeli air strikes on Syrian government facilities in Hama province. 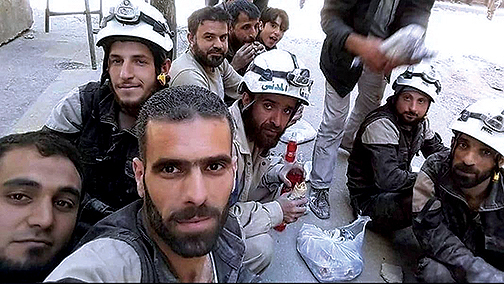 BBC ISIS propagandists promote "White Helmets"
Damascus condemned the extraction of hundreds of jihadists by Israel and its Western allies as a “criminal operation” and further proof of the foreign sponsoring that has fomented the nearly eight-year war. Of course, Netanyahu, Western governments and news media sought to portray the evacuation of the “White Helmets” as a “humanitarian gesture”. This was at the same time that Israeli warplanes and snipers were stepping up the killing medics and civilians in Gaza. Britain’s newly appointed foreign secretary Jeremy Hunt described the Israeli “rescue” of “White Helmets” as “fantastic news”, saying that the militants were the “bravest of the brave." We won’t delay too much here on this fraud. 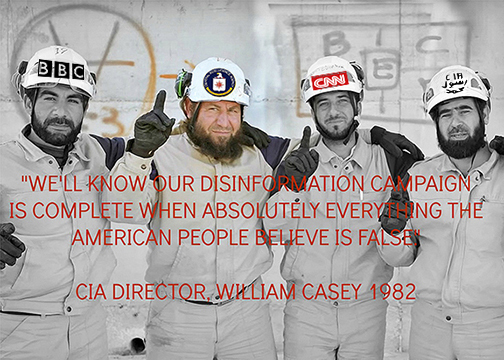 The so-called first responders of the “White Helmets” are a CIA, MI6-backed propaganda outfit working hand-in-hand with the terrorist militia. Their fake videos of chemical weapons attacks and air strikes have been a key propaganda device aided and abetted by the Western news media to demonize the Syrian armed forces and its Russian ally. The fictitious propaganda stunt alleging a chemical weapon attack in Douma on April 7 this year resulted in a barrage of air strikes by the US, Britain and France. 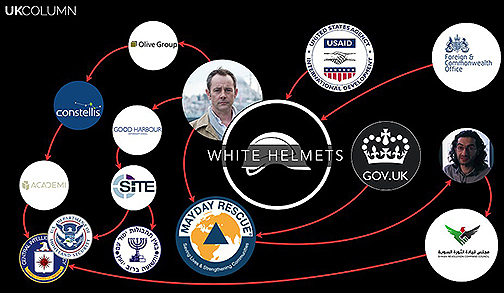 Created in 2013 by a British MI6 agent and former British army officer James Le Mesurier, the so-called White Helmets have been funded with hundreds of millions of dollars by the governments of the US, Britain and other NATO states. There is abundant video evidence showing members of this fake rescue group participating in gruesome executions by the al Qaeda-aligned militants with whom they associate. One such video shows an execution of a Syrian army soldier in Daraa, the city from where the latest evacuation of jihadists by Israel took place. Daraa is also, by the way, mendaciously referred to in the Western media as the “cradle of the revolution” or the “birthplace of the uprising” against President Assad’s government back in March 2011. The only thing that Daraa was a birthplace of was the US-led foreign covert war for regime change in Syria. Now here’s a curious thing about the latest salvaging of terror assets in Syria. The United States and Israel are not taking any of the 800 militants for resettlement. 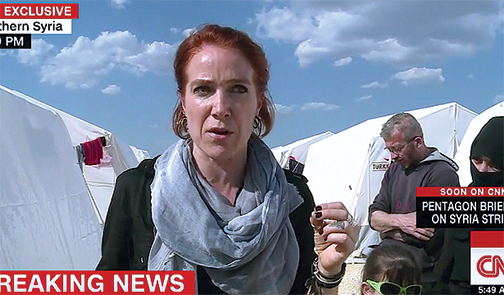 Independent investigative journalist Vanessa Beeley, who has done much to expose the real macabre nature of the White Helmets and their terror links, says that both the US and Israeli no doubt realize that by taking in such “war refugees” they are inviting terrorists into their own societies. Which makes you wonder why Britain, Germany and Canada are stepping up to the plate to offer the 800 White Helmets a home? 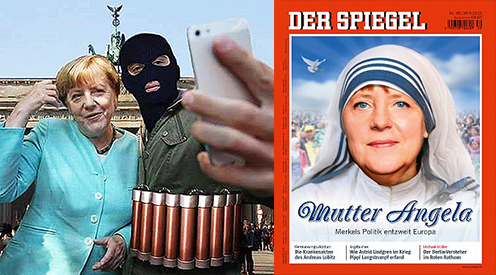 The case of Germany is particularly odd. Interior minister Horst Seehofer has personally authorized the resettlement of White Helmets spirited out of Syria by Israel. This is the same Seehofer who has mounted such a strong challenge to Chancellor Angela Merkel’s “open door” policy towards immigrants. 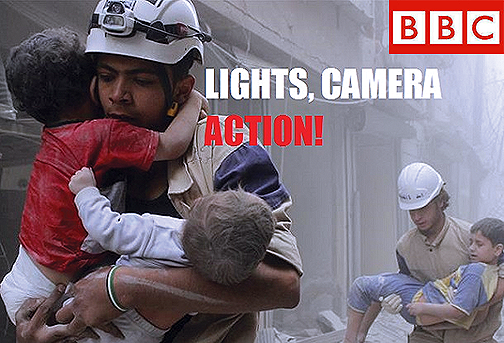 What we are witnessing is a suicidal ignorance by Western governments to take in these cadres of White Helmets. Perhaps Seehofer and other government ministers like Britain’s Jeremy Hunt are simply woefully misinformed. But surely the state security agencies of their respective countries know all too well the criminal, psychotic nature of the people whom they are allowing into their societies. Such a callous disregard for public safety is not unprecedented. In his well-researched book, My Fight For Syrian Freedom, Irish peace activist Dr Declan Hayes details numerous cases of how jihadist assets were knowingly cultivated by British and French state security services for the purpose of waging the covert war for regime change in Syria and Libya. These assets have been allowed to return to Britain and France under the cover of being “refugees”, with the security services turning a blind eye to their true identity. 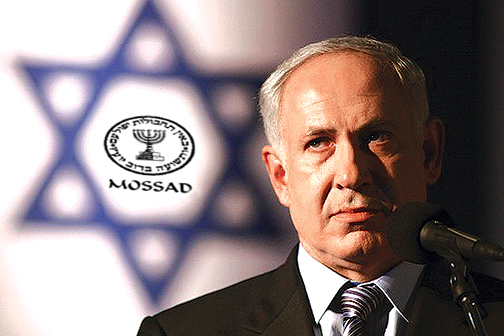 The nefarious relationship has resulted in these terror assets committing atrocities in Europe. For example, as Hayes points out, the Manchester concert bomb attack that killed 22 people in May last year was carried out by operatives belonging to a Libyan jihad cell that MI5 and MI6 had previously overseen for their objective of prosecuting the regime-change war in Libya against Muammar Gaddafi. Similar murky connections between jihadists “blooded in Syria” and state secret services have been have uncovered in terror attacks in France and Belgium. It is not clear if these terror assets go rogue or whether they are being used by British, French and other military intelligence as a deliberate provocation in order to promote tighter national security laws and greater surveillance powers over their citizens. Declan Hayes reckons that the problem of Western-sponsored terrorists returning to Britain and other European countries under the cover of claiming to be “war refugees” is much greater than Western governments or their media are admitting. Hayes says that in his experience of visiting Syria many times during the war, most families loyal to the government were adamantly defiant about staying in the country and defending their communities. He reckons that there is a legitimate concern that many of the refugees fleeing from formerly militant-held cities like Aleppo and Daraa are jihadists and their families. This view supports the right of some European governments to be wary about taking in large numbers of refugees from Syria and other war-torn countries. There is a case for rigorous vetting, but such a case is often emotionally blackmailed by naive media commentary as being “heartless” or “racist." There is no doubt that Western government agencies have fomented terrorist groups in Syria and elsewhere to do their dirty work for destabilizing target governments. Now that the war in Syria is all but over with the Syrian army, backed by Russia, Iran and Hezbollah, rooting out the last jihadist remnants, we are seeing Western states taking in their terror assets. Maybe as a desperate intervention to stop them from revealing the dirty secrets of Western government collusion. The repatriation of the White Helmets terrorist propagandists to the UK, Germany and Canada is a classic illustration. Western authorities are playing with fire. Not only are they running the risk of public safety from future terrorist incidents. They are also stoking the flames of xenophobia, racism and culture wars against many innocent refugees who have been given shelter in Western countries.